lt;stronggt;CWNCD0035YBlt;/stronggt;lt;BR/gt;Crown CD35 BYB Industrial Deck Plate Anti-Fatigue Mat, 3' x 5'lt;BR/gt;Make safety and comfort the standard practice at your workplace. 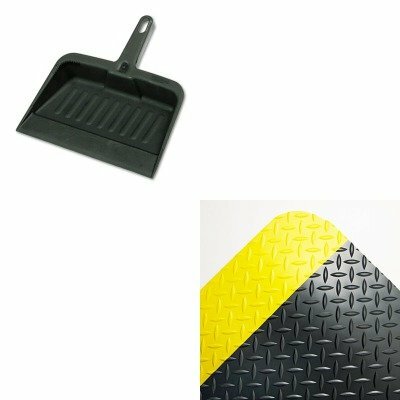 These mats feature a durable, slip-resistant surface with a diamond pattern texture to help reduce the risk of falling. Industrial-grade PVC foam backing fused to the top surface provides the comfort. Resistant to most common fluids and chemicalsideal for messy work areas. Beveled edges help increase safety by reducing the risk of tripping. Optional yellow borders for added visibility and safety. Mat Type: Anti-Fatigue Mat Application: IndoorIndustrial Materials: Vinyl.lt;BR/gt;lt;BR/gt;lt;stronggt;RCP2005CHAlt;/stronggt;lt;BR/gt;Crown CD35 BYB Industrial Deck Plate Anti-Fatigue Mat, 3' x 5'lt;BR/gt;Handy dustpan features a tapered front edge to help simplify sweeping-up. Heavy-duty, moderately flexible plastic provides commercial-grade durability. Lanyard handle-hole allows you to hang and store the pan out of the way. Material(s): Polypropylene; Width: 8 1/4quot;. ~ Includes one dustpan.